As big Hello Kitty fans, we were fortunate enough to attend Hello! Exploring the Supercute World of Hello Kitty, which opened on Saturday. 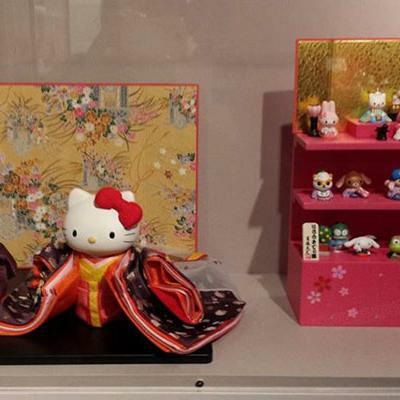 Held at the Japanese American National Museum, it is the first North American museum retrospective dedicated to Sanrio’s flagship character. 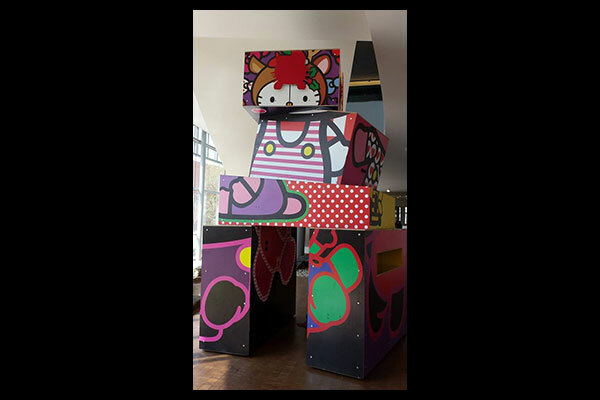 You’ll find items and artwork that explore the history and pop culture influence of Hello Kitty spread over two floors. 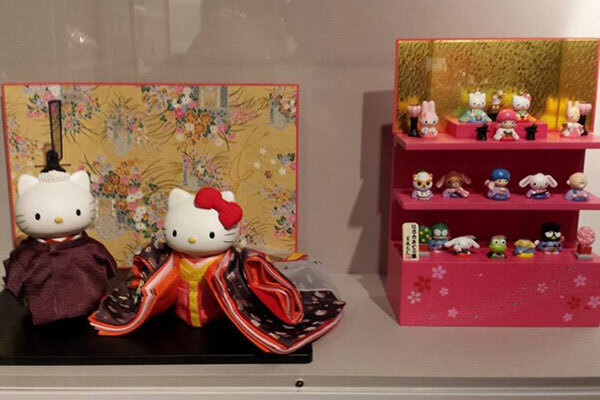 The first floor, curated by Dr. Christine Yano, author of Pink Globalization: Hello Kitty and Its Trek Across the Pacific, consists of memorabilia from Hello Kitty’s origins to items that the public can currently buy. 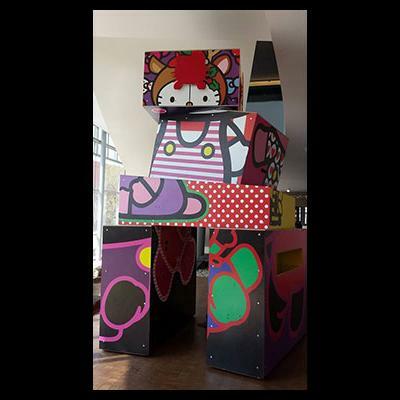 The second floor, curated by Jamie Rivadeneira, founder and owner of the L.A. pop culture boutique JapanLA, consists of art inspired by or dedicated to Hello Kitty. There were too many great pieces to count, but here are the must-see items at the show. As you walk in, Maloney’s piece is the first thing you see, even before you enter the exhibit. Hailing from L.A., the photographer is known for making interactive cubes that carry a message of tolerance and inclusivity. This piece shows Hello Kitty in different styles and colors, representing the different people who love her. Maloney’s current project, (Out of Many One), is another interactive photo cube in the plaza outside of the museum. The first item with a Hello Kitty character on it is a coin purse that dates to 1974. It shows Hello Kitty sitting between a milk bottle and a goldfish with her head tilted. 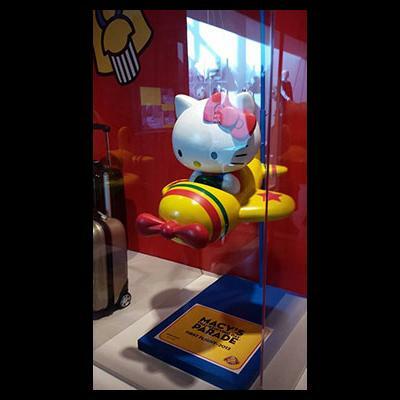 Though the museum only holds a copy of the archived item, the actual item will be displayed at Hello Kitty Con, happening later this month. 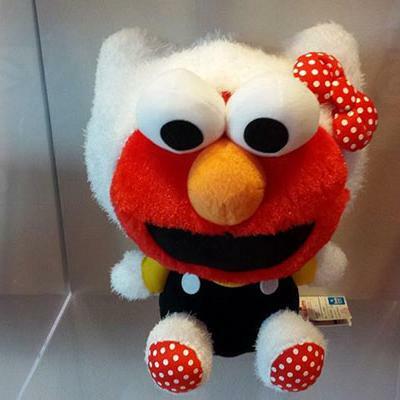 On a shelf filled with other character collaborations like Hello Kitty Chun Li and Hello Kitty Barbie, Hello Kitty Elmo stands out. 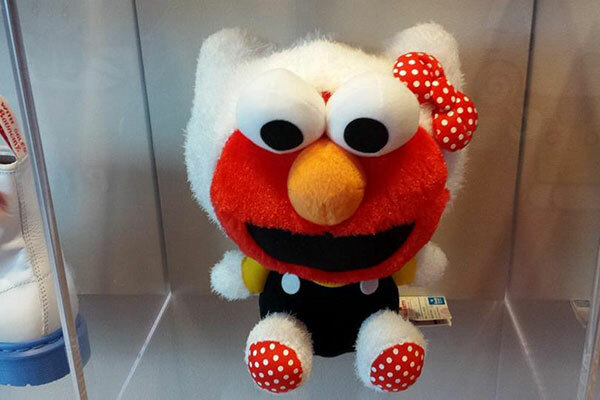 Maybe it’s because both Elmo and Hell Kitty were creations of the late ’70s or maybe it’s because of Elmo’s intense goggle-eyed stare, but they pair well together. Though much smaller in size, this is a version of the Hello Kitty float that showed up in the 2012 Macy’s parade. The float, which symbolized Hello Kitty’s ascent to a universal character, joined the ranks of other popular characters like Snoopy and Spiderman. As you walk further into the exhibit, you’ll see a wall filled with Hello Kitty Japanese items like sake cups and teapots. It also includes Hinamatsuri, or Girl’s Day dolls, which represent Japan’s Heian period when people believed that dolls would ward off bad luck. Sanrio has circled back to the company’s Japanese roots with this collection, which is striking, especially when you consider the fact that Hello Kitty isn’t actually a cat but a girl who lives with her parents in London. Fresh from Brooklyn, New York, Dennis’ paintings explore the power of hyper-realistic yet stark images that engage transformative possibilities inside and outside the painting that represent contemporary American culture. This painting represents a young adult girl who looks at Hello Kitty through a frame (presumably in a museum setting). Isn’t that what we’re all doing at the exhibit? Fantastical local artist and Teacher’s Pet creator Gary Baseman decided to paint one of his famous circus-like paintings in honor of Hello Kitty. This whimsical portrait finds Hello Kitty on a casual play date with other Sanrio characters. 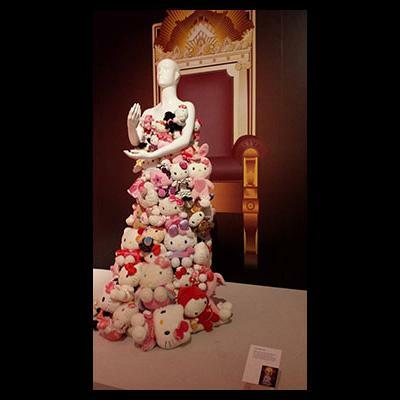 Remember that dress made of Hello Kitty stuffed animals that Lady Gaga once wore? It’s on display on the second floor. Not only does this represent the reverence Lady Gaga has for Hello Kitty, it also proves what an icon she is to celebrities around the world. 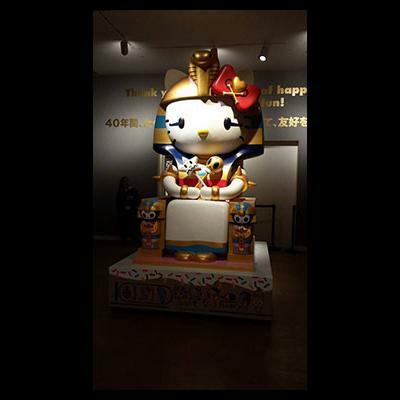 Near the end of the exhibit you’ll find “Kittypatra,” a huge Hello Kitty statue dressed in full Egyptian attire sitting on a throne. Created by Simone Legno, creative director of the Tokidoki brand of playful apparel, handbags and accessories, this detailed statue represents the brand’s philosophy that magical things can happen. Don’t miss the feline hieroglyphics on the statue’s back side. And you thought “Kittypatra” was the end. 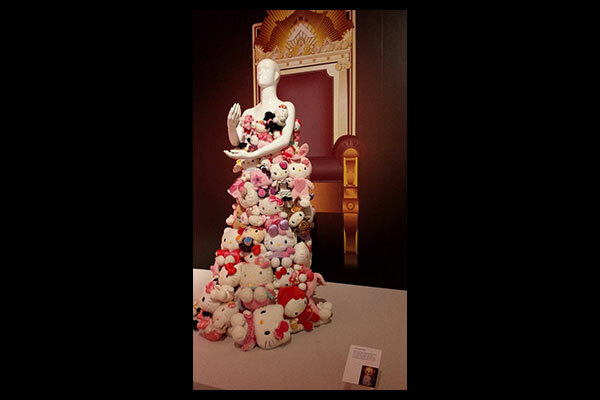 After walking through JANM’s Common Ground exhibit there’s a final sculpture that sums up Hello Kitty in the modern age. 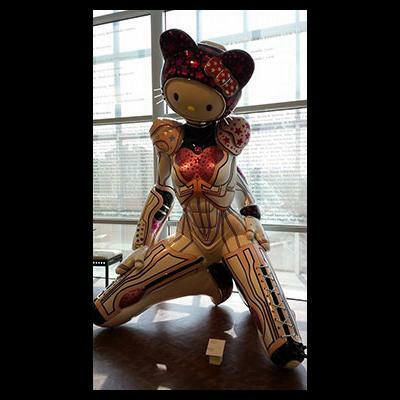 This colossal statue is a Hello Kitty-inspired cyborg (complete with scarily impressive abs) who seems to have come straight out of a mecha anime such as Neon Genesis Evangelion or Gundam. This “Super Space Titan Kitty” casts the typically soft creature in a new light while maintaining her femininity with the bright pink and white colors typically associated with Hello Kitty. What a way to end the exhibit.